Liberalism is not and has never been widespread in the Middle East. There have been moments when it seemed set to open new vistas to countries whose citizens wanted to break free from the chains of traditionalism, dictatorship, and religious obscurantism. There have been many setbacks, but in the early 1990s a group of intellectuals, known in contemporary Arabic literature as the New Arab Liberals, Al-Liberaliyun al-'Arab al-Judad, was informally established in the Arab Middle East. The group was formed in the wake of major global and regional events—the collapse of the Soviet Union and its ancillary communist regimes in eastern Europe (1989-91), the invasion of Kuwait by Iraq (1990), the repeal of the apartheid laws in South Africa (1991), and the official end of the Cold War (1992)—all of which suggested the advent of a new order internationally. This loosening of political tension was accompanied by the growth of globalization and a revolution in communications with the creation of the mobile phone and the Internet, both of which opened up new possibilities for international collaboration and free speech. The circumstances under which Hala Mustafa and other Egyptian liberals and reformers function are difficult. Egyptian liberal activists are denied access to the government-controlled communication networks. Mustafa personally has come under physical and psychological pressures that limit her freedom of movement, including tight supervision by the Egyptian security agencies and telephone tapping. She has also expressed fears for her life. These events had a great impact on intellectuals in the Middle East and encouraged Arab liberals to initiate a wide-scale public debate on the urgent need for change in their region. The debate that ensued, and which still continues, has focused on the issue of political and liberal reform in the Arab world and clearly reflects the predicament that faces modern liberal Arab thinkers. These liberals are deeply aware of massive changes taking place around them but are stymied in their own efforts by the undemocratic or antidemocratic regimes under which they live. Egyptian liberals occupy a central position among the members of this group in terms of their relative numbers and the resonance of their activity. Egypt's political, historical, and cultural stance along with its relatively liberal legacy, gave Egyptian liberals a prominent role in this Arab discourse despite ongoing pressure from an illiberal regime on the one hand and growing threats from Islamists of different varieties. The New Arab Liberals view themselves as the heirs and successors of the liberal Muslims and Arabs who were active between the late nineteenth century and the 1950s. Two things distinguish them from those early liberals. The first is their concentration on political matters, especially on internal reforms and the need for a democratic regime; the second is their strategic and rational view of political and global realities. The New Arab Liberals can be divided into three main categories: government liberals, part-government liberals, and independents. A government liberal is a paid employee of a governmental institution. This dependence may narrow an individual's ability to maneuver while carrying out his public activities and may dull criticism of the regime. The head of the Center for Strategic Research at the leading state newspaper, Al-Ahram in Cairo, 'Abd al-Monem Said, is an example of a government liberal identified with the regime. Most New Arab Liberals, however, are either partly governmental or independents. The part-governmental liberals, although paid employees of government institutions, actively criticize the regime and act publicly against official regime policies. Taking such a stand obviously jeopardizes their official standing and their careers. Noteworthy part-government liberals include the Egyptian feminist Hala Mustafa (whose activities will follow in detail later), Osama al-Ghazali Harb (Egypt), editor of the periodical As-Siyasa ad-Dawliya, Ahmad al-Baghdadi, Khalid ad-Dakhil and 'Abd al-Hamid al-Ansari (the last three from Persian Gulf States). Some independent Arab liberals live in their home countries, for example, the Cairo-based Egyptians Sa'ad al-Din Ibrahim and Amin al-Mahdi, but many others live outside the Arab world, thereby freeing themselves from the restrictions on freedom of speech in their countries of origin. These include George Trabishi and Burhan Ghalyun, both originally from Syria and now living in Paris, and Shaker al-Nabulsi, originally from Jordan, who lives in the United States. The movement's world-view is characterized by the centrality of the individual, civil rights, basic freedoms, equality, pluralism, progress, democracy, and science. Secularism, an essential ingredient for democratic developments elsewhere, is deliberately ignored on the grounds that it would alienate most Middle Eastern Muslims. But most Muslims consider democracy the only way to protect freedom and human dignity, so this demand provides a common denominator. For all that, the New Arab Liberals differ in their religion (a disproportionate number are Christian), their center of activity (in the Middle East, Europe, or North America), the extent of their independence from political institutions, and their ideological relation to Arabism, Islam, and the West. They differ in their views on practical matters, such as how far they will tolerate Islamists in the political system; how far they are prepared to accept normalization with Israel; how far they are willing to allow governmental financial involvement; and how far they approve of U.S. policy in the Middle East. The liberal discourse is unlike a folk song to which the drunkards sway from side to side, neither is it a populist discourse that is meant to quench the inclinations of the crowds … it is rather first and foremost directed at the educated elite since they are the ones who create history and not the loud crowds. The new liberals aim for profound, long-term political change within their countries, meaning the establishment of democratic states throughout the Arab world and a widespread assimilation of democratic values. The mass communications revolution of the 1990s opened up new audiences beyond the control of specific regimes. Through their criticism of Arab regimes, the New Arab Liberals made a broad impact on their audiences and generated a public debate regarding the urgent need for political reform. However, these Arab liberals find themselves in a difficult position between government and radical Islam. Given the significance of religion in Arab society and culture, the new liberals work hard to establish their legitimacy while emphasizing an attachment to their liberal Arab and Islamic heritage. They do this to underscore their claim that democratic values are universal and in harmony with the Islamic heritage. An additional difficulty the liberal group faces is the stigma of Western support, which is interpreted by many as an attempt to preserve a sort of colonialism. This sabotages the Arab liberals' credibility, identifying them as envoys of the West. The absence of charismatic leadership, the ideological disagreements among them, and their inability to unite under a single organizational framework increase internal rifts and hamper the new liberals' efforts to become a significant alternative to government. One voice increasingly heard among the New Arab Liberals is that of an Egyptian woman, Hala Mustafa, who plays a particularly important role within the group. Her courageous criticism of Egypt's political elite and of Arab society as a whole justifies her prominence as a leading liberal in the Arab world, despite her formal affiliation with the government as a member of the Policy Secretariat of the ruling National Democratic Party. Her prominence is all the more remarkable in that she is an outspoken woman in a patriarchal society. She is also sophisticated and Westernized. As such, she is anathema to the forces of radical Islam and traditionalism. In that sense, she has become a symbol of what liberalism means for Egypt and the wider Arab world. Mustafa was born in Cairo in 1958. She graduated with a bachelor's degree (1980), then a master's (1986) and finally a doctorate (1994) from the department of economics and political science at the University of Cairo. Between her studies there, she completed a continuing education program at the University of Maryland (1983) and an M.A. at the Institut d'Études Politiques de Paris (1986-87). She also served as a visiting fellow at the Washington Institute for Near East Policy during 2003 and 2006. 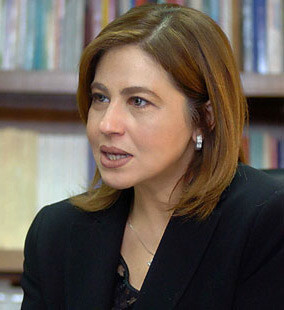 In addition to her role within the National Democratic Party, since 1994, she has served as director of the political department at the Center for Political and Strategic Research at Al-Ahram. Concurrently, she is chief editor of the Arabic periodical Al-Dimuqratiya, published by the Al-Ahram Center since 2000; it is the only periodical in the Arab world dedicated to the analysis of worldwide democratic developments and Arab liberal thought. in Egypt—one of the most important Arab countries of the region—there is a strong tradition of political debate and a vibrant intellectual life. There also are an extensive civil society, a judiciary intent on sustaining its autonomy and integrity, and a durable secular liberal tradition. Few addressed the merits of the secularism the French president wants to preserve, not for his own personal glory or that of his government, but to uphold France's long record of struggle for human freedom, fraternity, and equality. Few showed willingness to examine secularism neutrally and objectively. Human rights and freedoms developed in the context of secularism, for the latter paved the way to tolerance, freedom, and political accountability, just as it ended despotism in all its political and religious forms. Mustafa herself has backed up her support for secularism by arguing that the Arabs have a long secular tradition. If there is any truth in this, it cannot be denied that Arab secularists can and do come into conflict, not just with Islamists, but with government authorities when they uphold discriminatory legislation based on purely religious grounds. In the 1990s, Mustafa nailed her flag to the mast when she published several Arabic books regarding radical Islam, including Political Islam in Egypt and The State and the Oppositional Islamic Movements. In these she made clear her opposition to the politicization of religion. As with other Egyptian liberals, the circumstances under which Mustafa operates are difficult. Alongside their self-censure, Egyptian liberal activists are denied access to the government-controlled communication networks. Mustafa relates that she has come under physical and psychological pressures that limit her freedom of movement. She has, for instance, complained of tight supervision by the Egyptian security agencies, including telephone tapping and surveillance. She has pointed out that she fears for her life and that the "harsh security siege" in which she is placed has caused her to feel paralyzed. Moreover, some have compounded these problems by accusing her of serving as an U.S. secret agent. She denies that her membership in the Supreme Committee for Policy Planning of the ruling National Democratic Party provides her with immunity. Recently, she landed in the middle of a controversy following a meeting with the Israeli ambassador to Egypt at her office in the Al-Ahram Center. The journalists' union accused her of violating a previous union resolution that forbade any form of normalization with Israelis. She was summoned to the union's offices for further investigation and received a warning for violating the union's ban. This episode, reported not only in the Egyptian press but also in the wider Arab media, reflects the great many difficulties that face a prominent Arab liberal like Mustafa. Although Mustafa is a liberal officially associated with the establishment, she displays great courage in expressing unconventional views. In published articles, she profoundly criticizes the involvement of the security apparatus in political life: "The real threat of Egypt's state security apparatus … is that it continues to secretly manipulate the entire political system." According to her, it is no secret that the security services are deeply involved within the National Democratic Party to the extent that they select high-ranking officials and most of the party candidates for parliamentary elections. Likewise, she has claimed that recruitment to all positions is made on the basis of loyalty to the security authorities instead of professional excellence and skills, political background, or experience. Mustafa has, therefore, claimed that if the security services' "silent war" is not restrained, true political change and efforts to realize a "reform from within" will continue to be obstructed in Egypt. This will limit the progressive political elite and keep it ineffective; individuals capable of promise will systematically be treated as targets; moderate groups will be shut down, and citizens will be kept away from political life. Mustafa maintains that the political dominance of the National Democratic Party of President Hosni Mubarak extends to the security authorities, the government bureaucracy, and the national media. Mustafa stresses that Egypt has the richest liberal heritage in the region, a heritage that dates back to the end of the nineteenth century. She ascribes vast importance to Egyptian liberals active then and subsequently, singling them out for praise because they worked to instill liberal concepts of government and individual freedoms, sought independence for the legal system from the political authorities, strove to develop the notion of citizenship and to institute religious reform, strengthen women's status, and generate political pluralism. During the 1920s and 30s in Egypt, the most important laws and regulations regarding constitutional and parliamentary life were published, and for the first time, basic individual rights and freedoms were approved. As far as Mustafa is concerned, the 1923 Egyptian constitution clearly reflected the liberal vision in matters of society-state relations, governmental methods, and relations between the executive, legislature, and judiciary. For three decades (1923-52), Egyptians enjoyed constitutional rule and relative social freedom. Achieving independence from the British, the Egyptian parliament framed a constitution that called for Western-style government with a restricted monarchy. The press, universities, and intellectual life as a whole flourished. Liberalism took root in the cafés and clubs, only to be crushed after 1954 by the rise to power of Gamal Abdel Nasser. Nevertheless, Mustafa is troubled by the fact that Egypt's liberal experience did not produce a developed bourgeois class as occurred in Europe. There was a weak political foundation and not enough social power to spread liberal ideas. Mustafa believes that a lack of political independence prevented Egyptians from consolidating their experience of liberalism. The appearance in 1928 of the Muslim Brotherhood weakened liberalism from the beginning and destroyed the bridge between Islam and modernity, which earlier exponents of the reformist movement had established. Additionally, by focusing mainly on the elite, today's reformist liberals have failed to recruit wide support for their cause or to become a real alternative to those in power. The revolutionary fervor of Arab nationalism during the 1950s also negatively affected the development of today's reformist liberal trend. The nationalist Arab movement focused on the struggle against colonialism and demands for independence, and it came to be linked to a single-party system. Under these circumstances, pluralism was considered a form of fragmentation that conflicted with the movement's core purpose. As the nationalist movement developed, it gave rise to the principle of a single-party system, which led to a single leader and a single voice. The need to develop a democratic political culture in Arab society ranks as a central plank of Arab liberal discourse in general and for Mustafa in particular. She believes that the political culture includes all the issues leading to a democratic regime and that it plays a central role in speeding up or slowing down social change. For her, it is not enough to build constitutional institutions, such as governmental parties and a legislative body. There is an urgent need for cultural and liberal values that will inform the laws and institutions with meaning and content. According to Mustafa, the stagnation of political life in the Arab world is attributable to two types of factors. The first are populist, pan-Arab, and Islamic trends that developed after the 1950s and are by now deeply integrated within Arab political culture. These trends inherently oppose pluralism, democratic transformation, liberalism, and other Western values. The second factor is the absence of a sense of individualism. Arab culture emphasizes blood kinship, clan affiliations, and family ties over the individual, something that contradicts individual rights and freedoms. Therefore, the political culture still conveys a kind of collectiveness and anti-individualism that obstructs the road to democracy. Writing on political Islam, Mustafa stresses that Islamist movements refuse to acknowledge that the state is the highest source of political authority but adhere to the rule of God (Hakamiyat Allah). Therefore, they insist on canceling modern civil legislation and propose to replace it with Islamic laws. This implies a deep-rooted change in the nature of the modern state system and the foundations upon which it is based. It also dismisses people's right to choose an alternative to Islam or to recognize approaches that are beyond the scope of religious authority. Religious authority opposes freedom of opinion, thought, and faith. There is an inherent conflict within the Islamic movements over the principles of pluralism and open competition as forces in society, both of which constitute basic tenets of democracy. Thus, a large gap exists between Islamist declarations about their formal willingness to accept democracy and their lack of acceptance of its underlying principles. In an article published in the semiofficial Egyptian daily paper Al-Ahram, Mustafa harshly criticized the Islamic groups and the legacy of the Arab national movement. She called for self-criticism, allowing Arab societies to contend with the tremendous challenges that face them. She further warned against the gravest threats to the region, namely, the radical political and religio-political groups that overshadow Arab societies and their democratic, cultural, and social development. These forces focus on denying the "other," by which they mean the West, including its culture and values, and seek to defeat it. They strive to impose their political plans, not just on themselves but upon society at large. Mustafa concludes that the Arab world must reflect critically upon its activities. Arab society must hasten modernization while steering clear of slogans or erecting conspiracy and anti-Westernization theories. There is no escape from the centrality of the issue of individual freedom, she argues, for the individual is the essence of the construction and awakening of society. Democracy is not merely a confirmation of legal and constitutional rights or the establishment of political institutions, but exists within a culture and through the values in which the individual believes. She argues against the claim, which she says was cultivated by the Egyptian regime, that the only alternative to the current regime is an Islamic polity. Egypt's liberal-secular legacy means it has the potential to become a secular, moderate, liberal, and modern country. In addition, it enjoys the advantage of being relatively homogenous at most levels of society, unlike some other Arab countries (Iraq, Lebanon, Syria), which have to deal with ethnic rifts that inhibit the development of democracy. Mustafa views the Muslim Brotherhood's relationship with the regime as one of mutual dependence and points to a tacit and bizarre alliance between the government and the Brotherhood. The regime uses the Brotherhood to frighten the United States and other Western countries about what might happen in Egypt. In practice, Mustafa stresses—unlike many other observers—that the Brotherhood is unable to overthrow the regime or take over the political system, and that its influence is much less significant than it may seem. When trying to explain why the regime allows the Brotherhood significantly more political and media coverage than the liberals, Mustafa notes that the conflicts between the government and the Brotherhood have to do with power-sharing in the regime, whereas the discord between the regime and the liberals is more of a threat to the status quo since it is based on ideology and political principles. Thus, the government persistently denies legitimacy to liberal reformers who are devoted to an alternative, secular, and popular political challenge. Historically, political stagnation and the weakening or elimination of political parties during the eras of Arab socialism and nationalism (which were led by liberals), resulted in the mosques becoming alternative centers through which political debate, calls for the right of free expression, disagreement, criticism, and opposition were voiced. This opposition developed into an armed and violent force. Mustafa does not limit the political crisis in Egypt during the last three decades to the Islamists and how far they have become integrated into the political system. Rather, the question should be: How can Egyptians allow representation for all political trends, not just Arab nationalism and political Islam? It is Mustafa's impression that should true reform take place, the Muslim Brotherhood will be unable to obtain any substantial political advance. Political reform would constitute a barrier to the Brotherhood since it would no longer represent the only alternative to the government. Reform would change the status quo and the balance of power. As a result, new trends would arise and compete with each other. On the other hand, granting the Muslim Brotherhood legal status would most likely contribute to the further Islamization of politics. It has long been the declared objective of U.S. foreign policy to support and advance the notion of democracy and civil rights around the world. This policy is firmly rooted in the American liberal tradition, and the traditional American approach, employed since the end of World War II, has been to preserve pro-Western regimes in the Middle East and to change the allegiance of states that collaborated with the Soviet Union. In contrast, the George W. Bush administration developed a fresh U.S. perspective after the 9/11 attacks, treating the task of spreading democracy in the Middle East as a security-related strategic objective and not just as an exercise in spreading liberal, progressive values. Continued political stagnation in the Middle East was viewed as a threat to the peace and stability of the region and thus to the security of Western countries. A process of gradual democratization in the Middle East would, on the other hand, strengthen stability and promote prosperity and peace in the region. Mustafa sees attempts by the Bush administration to establish a "Greater Middle East"—via the "Middle East Partnership Initiative" adopted in December 2002—being based on two ideas: first, the need to advance reform and democratization in the region, and second, to find a permanent solution to the Arab-Israeli conflict, which is a source of tension, violence, and instability. According to Mustafa, this initiative was introduced in a similar way to the 1975 Helsinki accords between the Western countries, including the United States, and the countries of the communist bloc in Eastern Europe. Although the purpose of the Helsinki accords was to ensure the mutual recognition of safe borders and to decide on an arbitration mechanism and other means of preserving peace, the agreements emphasized that signatories, including the Soviet Union, would provide legal frameworks to guarantee basic human rights and freedoms. Mustafa estimates that the U.S. and European assumptions behind the Helsinki accords provided inspiration for the idea of an expanded Middle East, which contains issues regarding liberalization and democratization that might determine U.S. relations with its allies in the region. Mustafa believes that the U.S. call for democracy and an increase in political participation, particularly for women, is in and of itself valid; but she says the cultural and social environment in the Arab world cannot yet respond to these demands. In terms of culture and social relations, the Arab world differs from Eastern Europe or Latin America. Individualism, liberalism, secularism, and modernity, which are linked to the essence of civil rights and freedoms as they developed in the West, are part of these societies' cultural norms, however much they differ in realizing these rights and freedoms. In the Arab world, most societies are still undergoing transformation not only through democratization but, more importantly, in matters of modernization. Therefore, any form of external support, like that of the U.S. initiative, will not succeed unless these changes are welcomed by Arab culture. Such changes should concern social relevance and cultural values as well as politics and procedural matters. To overcome these obstacles requires a broad outlook that considers all the social aspects with a view to a long-term policy that will not prioritize political democracy at the expense of cultural modernization and liberalism. Many of Mustafa's efforts have been devoted to convincing the U.S. government to change its policy towards Egypt and thus force profound political reforms in that country. In her opinion, Washington must give priority to political reforms over traditional issues such as the economy, commerce, and Egypt's role in preserving the regional status quo. Mustafa argues for an approach that involves direct pressure on the Egyptian regime to implement liberalization of the political environment and the media. The U.S. strategy should focus on reinforcing the liberal democrats and not just the democratic process itself, while prioritizing a constitutional reform based on secular principles. The goal is to open the political system, refashion the political elite, liberalize the media, empower women, and reevaluate the role of the security mechanisms in political life. How can this be brought about? Mustafa believes that between doing nothing and "the romantic option," as she puts it, which supports having elections now, Washington ought to choose a third option, namely, a gradual and consistent liberalization. This implies taking action in conjunction with some Arab leaders to open the political system, encourage open and more responsible media, increase the rate of women's participation in public life, carry out a modernization of the education system, improve the legal systems, and introduce gradual political reforms. This long and difficult process requires the investment of a great deal of attention from high political levels within the U.S. government. Short of that, U.S. slogans about the "spread of democracy" will remain empty. Hala Mustafa stands out among New Arab Liberals for her courage, criticism, sharpness of thought, and public influence. She believes in a close association between existing Arab culture, customs, traditions, and behavior on the one hand and the process of democratization on the other. Pan-Arab nationalist and Islamist trends have nurtured a populist, political tradition that stands in opposition to values of pluralism, liberalism, and individualism. In Mustafa's eyes, it is unfortunate that the political culture and Arab politics emphasize the role of the collective over the individual and favor group affinities over national. All of these have raised obstacles to a multiparty, democratic regime. There must be a change in the makeup of the current political elite, which monopolizes the technocratic, bureaucratic, and security bodies, if the current stagnation is to end. Mustafa holds that increasing the proportion of women's representation and participation in the reform process is an essential step. And she believes Washington must change its policy to favor modernization and cultural liberalization over procedural democracy. The Arabic-speaking countries boast no full democracies, but that does not mean there are not many Arabs who aspire to democracy. However, they are just too few in number to make much of a difference. Since the mid-1950s, military-backed regimes and the majority of political movements and parties in Arab countries have pushed democracy to the margins of public life. Instead, their political agendas have been the creation of an Arab identity, the struggle to free individual countries from colonial rule, and the achievement of pan-Arab unity. In the early 1980s, however, inspired by the democratization that had been taking place in Portugal (from 1974), Spain (from 1975), South America, and several Asian countries, some Arabic-speaking intellectuals raised the question of whether or not democracy is a universal principle. After the collapse of the Soviet bloc and the defeat of Iraq in the Kuwait war, the Arab Middle East witnessed a wide-scale public discourse on the issue of political reform and democratization. The post-9/11initiatives of former U.S. president George W. Bush regarding democratization in the region further stimulated this debate. But that debate still flounders, held back everywhere by illiberal regimes and the growing strength of religious revivalism. Without free speech, there can be little hope for real progress. The opprobrium unleashed on Hala Mustafa simply for meeting the ambassador of a country with which Egypt is at peace, shows how difficult democratization can be when confined by public bigotry and governmental inertia. If the United States and other Western powers are serious about promoting democracy and the freedoms that go with it, they must resolve to put their strength behind the reformers, including the New Arab Liberals. Hani Nusari, "Al-Liberaliyun al-Judad fi 'l-Mintaqa al-'Arabiya," Milaff al-Ahram al-Istratiji, Nov. 2004; Majdi Khalil, "Al-Liberaliyun al-'Arab al-Judad … Khalfiya 'Amma (1)," METransparent.com, May 5, 2006. Nusari, "Al-Liberaliyun al-Judad fi 'l-Mintaqa al-'Arabiya," p. 119; Said 'Akasha, "Limadha Fashalat Ajyal al-Liberaliyin al-Misriyin fi 't-Tahawwul ila Tayar Fikri aw Siyasi," Ahwal Masriya (Cairo), Fall 2002, pp. 124-32. Shimon Shamir, "Hayesh 'Atid Lemegamot Haneorut baolam Ha'aravi?" Alpayim, 31(969):141, 149-50; Hazm Sa'giya, "Nazra ila Masa'ib an yakun al-Mar'a Liberaliyin fi 'l-'Alam al-'Arabi," Al-Hayat (London), May 15, 2003. Shaker al-Nabulsi, "Hal yataqadam al-Liberalyun wa-tataraj'a al-Usuliya," Elaph (London), Mar. 24, 2008. Hala Mustafa, interview, Al-Misri al-Yawm (Cairo), Nov. 19, 2006; Al-Misri al-Yawm, Nov. 4, 2008. Hala Mustafa and Augustus Richard Norton, "Let's help Egypt get democratic," Newsday, Feb. 16, 2007. Hala Mustafa, "Our secular legacy," Al-Ahram Weekly (Cairo), Jan. 15-21, 2004. Hala Mustafa, Al-Islam al-Siyasi fi Misr: Min Harakat al-Islah ila Jama'at al-'Unf (Cairo: Al-Ahram Center for Political and Strategic Studies, 1992). Hala Mustafa, Al-Dawla wa al-Harakat al-Islamiya al-Mu'ara'da (Cairo: Al-Mahrusa Center, 1995). Hala Mustafa and Augusts Richard Norton, "Stalled Reform: The Case of Egypt," Current History, Jan. 2007, p. 40; Roger Cohen, "10 Reasons Terror Meets Silence from Muslims," The New York Times, Oct. 26, 2005. Mustafa, Al-Misri al-Yawm, Nov. 4, 19, 2006. Hala Mustafa, interview, Al-'Arabi al-Nasiri (Cairo), Dec. 10, 2006. Al-Ahram (Cairo), Feb. 3, 2010. Al-Misri al-Yawm, Sept. 18, 19, 25; Ar-Ra'y (Amman), Sept. 18, 2009; Al-Quds al-'Arabi (London), Sept. 23, 2009. Hala Mustafa, "Ending the Silent War in Egypt," The Washington Post, Dec. 24, 2005. Mustafa, "Ending the Silent War in Egypt"; Al-Misri al-Yawm, Nov. 4, 2008. Hala Mustafa, "A Policy for Promoting Liberal Democracy in Egypt," Voices from the Middle East on Democratization and Reform, Foundation for Defense of Democracies, May 2006, p. 2.; Mustafa, "Ending the Silent War in Egypt." Mustafa, "Ending the Silent War in Egypt." Hala Mustafa, "Dubious Democracy on the Nile," The Washington Post, Nov. 5, 2005. Hala Mustafa, "Egypt Constitutional Reform: Islamism Versus Secular Liberalism," Democracy Review, Jan. 2007. Hala Mustafa, "Al-Liberaliya al-Mafquda 'Arabiyan," Al-Dimuqratiya, Apr. 2003. Hala Mustafa, "The Return of the Spirit," Al-Ahram Weekly, Jan. 13, 2005. Hala Mustafa, "Al-Kalima, al-Hurriya wa al-Ma'suliya," Al-Ahram (Cairo), Jan. 17, 2006; Hala Mustafa, "On the Discourse of Reform," Al-Ahram Weekly, Apr. 15, 2004; Ibrahim Abrash, "Al-Dimuqratiya bayna Almaniyat al-Fikra wa Khususiyat at-Tatbiq Mukaraba Li 't-Tagharruba al-Maghribiya," Al-Mustaqbal al-'Arabi (Beirut), Nov. 1999, pp. 52-8; Fawaz Girgis, "At-Taswiya as-Silmiya wa 't-Tatawwur ad-Dimuqrati fi 'l-Watan al-'Arabi," Al-Mustaqbal al-'Arabi, Nov. 2000, p. 187. Hala Mustafa, "A Better Middle East," Al-Ahram Weekly, Feb. 26, 2004. Hala Mustafa, "Al-Fard Masdar Sa'ada al-Mujtama' wa Mustahiqquha," Al-Dimuqratiya, July 2003. Hala Mustafa, "Al-Liberalyun wa San'a al-Mustaqbal," Al-Dimuqratiya, Oct. 2003; Hala Mustafa, "Al-Fard Masdar Sa'ada al-Mujtama' wa Mustahiqquha." Hala Mustafa, "Al-Mashru'a as-Siyasi al-Almani: Hal Naqaha fi Taqdim Badil," Al-Dimuqratiya, Jan. 2002. Hala Mustafa, "Hata la Nadur fi Halqa Mufarriqa," Al-Ahram, Apr. 29, 2003. Mustafa, "Hata la Nadur fi Halqa Mufarriqa." Mustafa, "A Policy for Promoting Liberal Democracy in Egypt." Mustafa and Norton, "Stalled Reform: The Case of Egypt," p. 40. Hala Mustafa, "Hadith al-Azhar…wa 'l-'Awda li 's-Su'al al-Awwal: Madha 'an al-Hal as-Siyasi," Asharq al-Awsat (London), Apr. 11, 2005. Hala Mustafa, "Confronting Present and Past," Al-Ahram Weekly, Apr. 21, 2005. Mustafa, Al-'Arabi al-Nasiri, Dec. 10, 2006. Mustafa, "Dubious Democracy on the Nile." Richard N. Haass, "Towards Greater Democracy in the Muslim World," remarks to the Council on Foreign Relations, Washington, D.C., Dec. 4, 2002. "Middle East Partnership Initiative," U.S. Department of State, accessed Mar. 30, 2010. Mustafa, "A Better Middle East." Hala Mustafa, "Al-Mubadara al-Amrikiya Li 'd-Dimuqratiya fi 'l-'Alam al-'Arabi," Al-Dimuqratiya, Jan. 2003. Hala Mustafa, "A Policy for Promoting Liberal Democracy in Egypt," p. 7. Hala Mustafa and David Makovsky, "Building Arab Democracy," The Washington Post, Nov. 18, 2003. Hala Mustafa, "Amrika wa 'd-Dimuqratiya fi 'sh-Sharq al-Awsat," Al-Dimuqratiya, Oct. 2002. Related Topics: Democracy and Islam, Middle East politics, Moderate Muslims | Spring 2010 MEQ receive the latest by email: subscribe to the free mef mailing list This text may be reposted or forwarded so long as it is presented as an integral whole with complete and accurate information provided about its author, date, place of publication, and original URL.